How Much Does DJ Insurance Cost? Where to Get DJ Insurance? DJing may seem like a relatively safe job where you can just relax and playback your favorite mixes. On the contrary, a little fluke can end up destroying your career. Let’s face it, when people are grooving to your music, things can get a little out of control. It takes one person tripping over a wire or spilling his drink to cause absolute chaos. What you are left with are damaged equipment, destroyed venues, and several injured people. You might as well pack up your stuff and leave the country. There are bound to be several lawsuits being filed against you. On the other hand, if you play it smart and get DJ insurance, you can save yourself a lot of trouble and still be a renowned DJ. Whether you’re a mobile DJ or a club DJ, insurance not only helps you prevent lawsuits but also helps you protect your equipment and cover its costs. If you want to find more about what insurance options you have as a DJ, read ahead and find out! This insurance helps you cover any damages to property and venue in case of accidents. Usually, the coverage is about one million to two million dollars. Furthermore, the insurance covers any injuries to other people around you caused by your equipment. 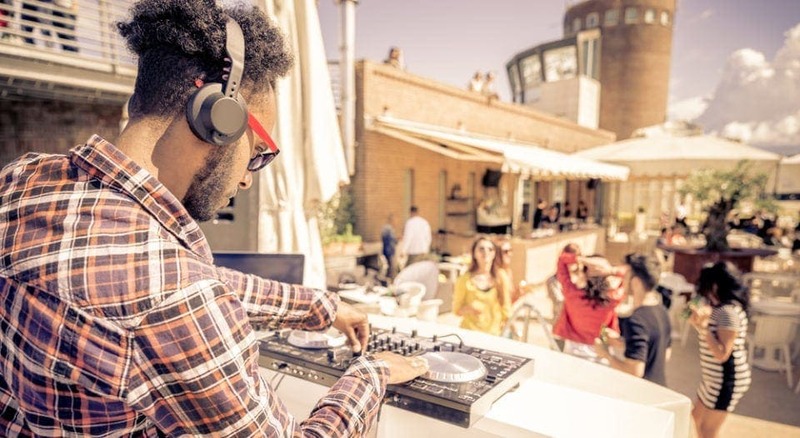 If you’re a DJ that performs regularly at nightclubs or bars, then this insurance can help you avoid lawsuits and costs in damages. Most nightclubs already have a liability coverage which you can use as well. On the other hand, some clubs might ask you to have your own liability coverage before they can book you. We highly recommend that you ask your nightclub owners about what kind of protection they provide and how much are they willing to extend to you. If, however, you are working for weddings, private parties etc. as a mobile DJ, then you need to get your own coverage. Private venues also require you to carry your own coverage sometimes. This insurance helps you cover the cost of any damaged or stolen equipment. There are conditions and terms to the policy as well. These can include sufficient evidence that the equipment was stolen or that the damage was not caused by the Police. It can help you protect your equipment from damage especially if you’re a mobile DJ. DJ equipment tends to be very fragile and can cost hundreds of dollars! If you’re often carrying it around, chances are you can damage it easily. The coverage helps you protect it from damage or theft. Of course, there are a few precautions you need to follow. Always ensure that the alarm is set and the doors are locked. This way, the insurance claim investigators can make sure that the house was actually breached. Furthermore, keep in mind to declare the actual value of the products. This way, if any unfortunate event occurs, you’ll be reimbursed with the full amount. The insurance helps cover any costs if the club steals or damages your gear or in case it doesn’t pay you. As we’ve already mentioned, DJ equipment can cost a lot. You don’t want to be on the short end of the stick when someone betrays you. If your club owner or manager steals your property or even if one of your employees steal the equipment, you can rest easy knowing your insurance will cover the costs. Apart from this, your club owner can refuse to pay you for outrageous reasons. This way you can try aiming for every gig without worrying about any frauds. The insurance will reimburse you for any such costs. The insurance agent might tell you in detail about the kind of coverage they offer. It’s very tempting to sign it off, thinking you are aware of all their terms. We highly recommend that you proofread their policy and check thoroughly for all fine print. This helps you understand the coverage much better. Most insurance companies ask you to make premium annual installations based on the total value of your equipment. It’s tempting to claim a smaller value to get a smaller premium, but keep in mind that you’ll only get covered for the amount you claim. There are numerous DJ associations out there that offer discounts on various coverage options. These DJ associations charge a small amount of money for registration, nevertheless, the long-term benefits are undeniable. The average yearly premium installation ranges from $100 – $400 and provides a coverage of about $1,000,000 – $2,000,000. The average annual premium installments are about $150 – $200 for equipment worth $15,000. There are various local companies that offer DJ insurance. We recommend that you carefully research the policies these companies offer and then opt for the best one. Most of these companies offer online quotes where you simply need to enter the data and get an accurate quote on your required policy. All in all, a DJ insurance policy can help you protect your equipment and keep your business running even after disaster strikes. No more worrying about spilled alcohol on the laptop at the nightclubs or the speakers falling! Of course, you should be careful, but the insurance will help you focus on your job without worrying about pesky details!